Boyds, Md. 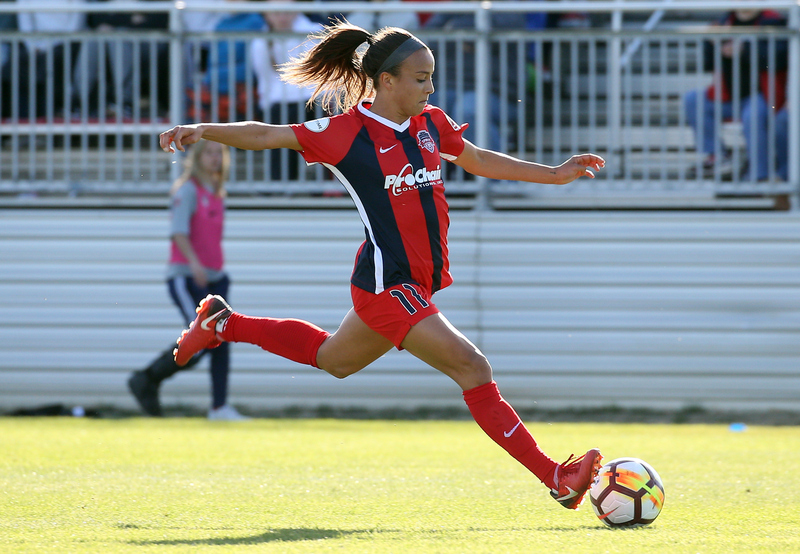 (3/23/19) – The Washington Spirit hosted French side Girondins de Bordeaux at the Maryland SoccerPlex as they played the second of four preseason games before the beginning of the 2019 NWSL season. The Spirit took control of the game early, creating multiple chances. Forward Mallory Pugh found herself with two opportunities to put the Spirit ahead early. The first coming off a direct free kick in the 7th minute at point-blank range, followed by another shot four minutes later inside the box following a cross by forward Ashley Hatch. Both shots found themselves saved by Bordeaux goalkeeper Erin Nayler. Spirit midfielder Rose Lavelle nearly gave Washington the lead in the 14th minute as she played a give-and-go in the oppositions box with Pugh, which got her inside the 6-yard-box, but her shot dragged wide, finding only the outside netting. The Spirit’s offensive pressure was rewarded in the 35th minute, after a blistering Pugh header rocked off the post and found its way into the path of Bordeaux defender Chloe Bornes who could not react in time, putting the ball into the back of her own net to make it 1-0 to the Spirit. After taking the lead into the half, Bordeaux equalized in the 55th minute off a Claire Lavogez free kick, followed by two more goals from Bordeaux forward Viviane Asseyi in the 79th (PK) and 91st minute, concluding a hard-fought 3-1 game.